On Monday 10th, I attended the working party that is to consider potential improvements to the almshouses at Hastings. It was a wide-ranging discussion that considered the possible refurbishing of the bungalows, the timetable for road resurfacing and the ratio of Watermen to commercial tenants. On Tuesday, I attended the first of the various quarterly committee meetings that are the working heart of the Company. This was the Almshouses & Charities Committee, which covered a wide range of topics: everything from road surfacing to charity fundraising. I had to leave the discussions early to attend a Court Lunch of the Water Conservators held at the Armourers Hall. One is always surprised by the connections one can make at these events: the speaker was until recently HM Lieutenant of Bristol and, chatting to her husband, I realised that my film company had been regular customers of his firm, Alexandra Workwear, through the 80s and 90s – a small world! The latter part of the week I took off to accompany Susan on a weekend trip to Gerona organised by her company, the Glaziers & Painters of Glass: all very educational – plus a bonus day spent at a vineyard! The Worshipful Company of Farmers held a lunch for Masters and Clerks on Monday 17th September and again I immediately found common ground with my two neighbours at lunch: the Junior Warden of the Farmers, David Bolton, is also the President of Norwich Rowing Club; and the Clerk to the Plumbers served in the RAF as an HR specialist, my own academic field. It was a very convivial lunch with a young speaker, one of the Farmers’ own scholars, speaking passionately on environmental issues. Interestingly, she spoke before the lunch and I wondered whether the Company should consider doing the same? Opinions invited. The next day was a return to the real business of the Company with a meeting of the Apprenticeship & Training Committee to hear the Training Officer’s report on the 36 new apprentices bound in the current year, and the reports of those who had been sponsored to go on sail training, the forthcoming draw-down walk, and possible revisions to the BML training. The committee also discussed the work being done towards the proposed Trailblazer apprenticeship scheme and the Company’s response to the Mayor’s Consultation on Safeguarded Wharfs. 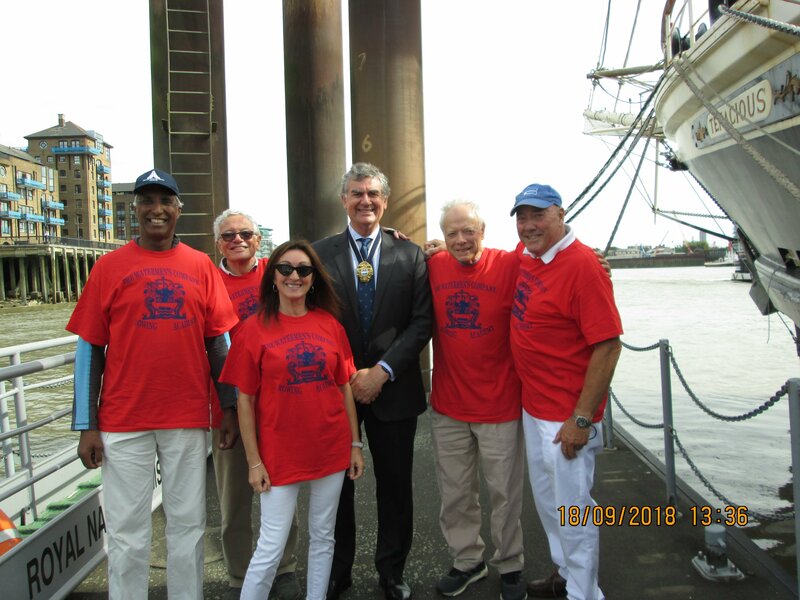 Sadly I missed the second half of the meeting because I had been invited to join the Londonium III as a guest of the City Sheriffs to watch their sponsored row from Westminster to HMS President. I knew that the Company had been asked to provide a crew but assumed that the invitation had gone to all the City companies. At the Westminster Boating Base, however, it became obvious that the Watermen had been specially selected for the honour of accompanying the Sheriffs. The crew for the Jim Holt had been organised by Craft Owning Freeman Tony Bull and comprised Craft Owning Freemen Chris Gooderidge, Derek Whyatt, Philip Foster, Past Master Jeremy Randall, Sue Perry-Whitehead (passenger), Nick Paul (cox) and Geoff Probert (Phyllis Court Rowing Club). The row alongside the Sheriffs was not intended to be a race, but with Past Master Randall in the stroke seat a competition was inevitable and so the Jim Holt was first to Tower Bridge. The reward was that, having disembarked at HMS President, the crew were invited to join the reception for the Sheriffs and assembled Livery Masters where it was announced that the Sheriffs row might become an annual event with all companies invited to participate: whatever – the Watermen & Lightermen were there first! Afterwards the Watermen’s representatives moved on to the Dicken’s Inn where, having generously offered to buy the crew a drink, I had to be bailed out by Mrs Carole Bull having left my wallet at the Hall – thank you again Carole. There were two committee meetings in the next two days. On the Wednesday, the Membership Committee met and we interviewed four new candidates for the Freedom, all of whom were approved. The Kitchen Committee met on the Thursday when Mark Grove of Cook & Butler (and the current Master of the Worshipful Company of Cooks) joined us to review forthcoming events. There was some discussion about the timing of the Company’s ladies’ events which, inadvertently, were all scheduled over two weeks in April/May. The decision was made to postpone the 2019 Ladies’ Dinner to November and, given we have a growing number of female Freemen, to consider a more gender-neutral title. The last meeting of the week was the Progression Working Party. The title probably needs some explanation. Historically, those joining the Court join as Assistants and progress year-by-year to eventually become a Warden and then, after four years, the Master. However, this straight, chronological progression makes no allowances for an Assistant’s personal circumstances or his or her own career path. Also, it might be that not everyone wants to progress to become a Warden, and thus Master. Therefore, one of my projects for the year is for this working party to review the Company’s current practices and see whether firstly, more flexibility can be introduced so that Court members have some control of when they become Master, and secondly to investigate whether the Court could be more open so that Freemen can apply to observe it and assess if they wish to participate. The Working Party came up with several interesting and useful ideas and its members are canvasing opinions among the Court and Freemen.